Creating a classifieds or listings website with WordPress isn’t as difficult as you might think. In fact, there are plenty of WordPress themes that allow site admins to build a website from scratch in a matter of minutes. They come with gorgeous design and awesome functionality, so you don’t need to worry about implementing any complicated code. More importantly, they’re insanely easy to customize and enable you to configure search settings and enhance the customized quality of your web page. Eager to get started? Here’s a carefully curated collection of the 10 best classified WordPress themes available today. 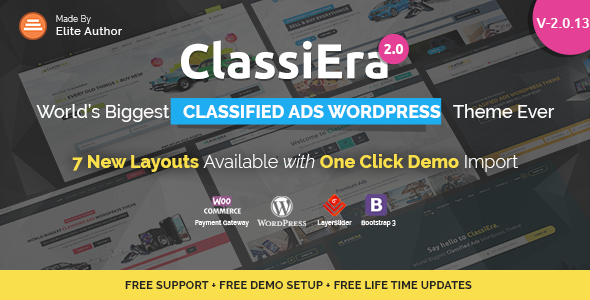 One of the most popular premium WordPress themes on the market, Classiera makes use of a Redux framework with flexible user Penal. The theme comes with 6 unique homepage designs to choose from, an exclusive front-end user panel, and multiple customization options. It’s integrated with Google Maps, allows you to post video ads, and offers an advanced search bar meant to help users find specific ads based on category and location. In short, Classiera facilitates ease of use and optimal viewing experience. We’re clearly talking about one of the best classified WordPress themes available. 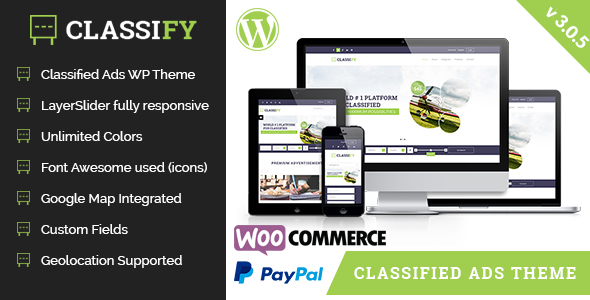 Our list of the best classified WordPress themes on the market wouldn’t be complete without Listify. 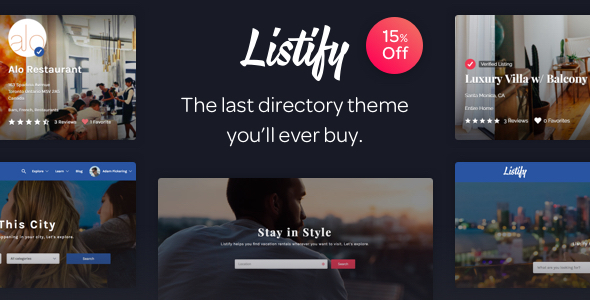 A gorgeous directory theme, Listify comes with a drag and drop page builder, powerful plugin integration, and it allows you to offer premium classified ad listing options for users. The theme enables you to create any listing site including real estate, automobiles, tourism, household items, food, and dining, and so on. Your site will be a thing of beauty. FlatAds is a premium directory/listing WordPress theme, flexible and fully responsive. It’s compatible with WooCommerce, Google Maps, BBpress, PayPal and MailChimp. The theme has a strong focus on typography, usability, and overall user-experience, making it easy to set up and customize. LayerSlider is included, so the theme packs great value and promises a smooth installation process. In other words, it’s got everything you need to get your site online in a jiffy. Beautiful and flexible, Classify was designed with a strong focus on typography, usability and overall user-experience. Hence, it’s very quick to setup and easy to customize. Video ads are supported; plus, the theme is integrated with PayPal, WooCommerce, and Google Maps, making your job considerably easier. Classify also offers advanced search and the LayerSlider plugin. Besides dazzling design, this WordPress theme was built to impress, packing a suite of features any site admin will find useful. Globo is fast, stunning, and comes with lots of ready-made page templates you can customize based on your particular needs. It supports both Stripe and Briantree payment gateways, offers advanced search, and enables you to offer premium membership plans. No list of the best classified WordPress themes would be complete without Globo. 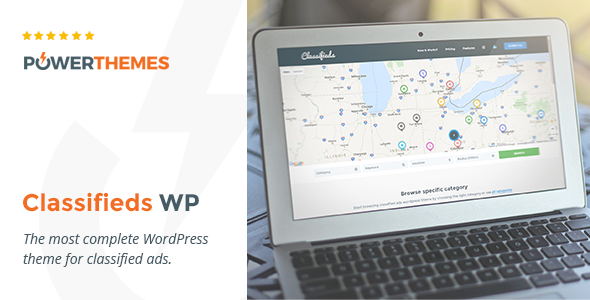 Built to be beautiful, fast and powerful, Classifieds packs all the features you need to get your site up and running quickly and painlessly. It comes with Google Geolocation Search and a range of payment methods which support major world currencies. This means that you can use this theme in any corner of the world and gain profit from it. It’s fast and reliable, not to mention the fact that its advanced search is perfection. You would be amazed by how easy you will be able to set up your site. Looking to build a stunning automotive and boat selling ad site? We’ve got just the theme for you. 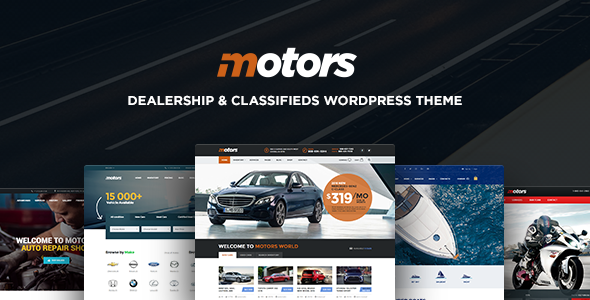 Motors offers four unique demos to choose from, based on your niche: a car dealership demo, a directory & listings demo, a car repair/mechanics service demo, and a boat dealership demo. It comes with advanced and easily customizable search options, a Compare Features page, and even a finance calculator to help you smash your competition. 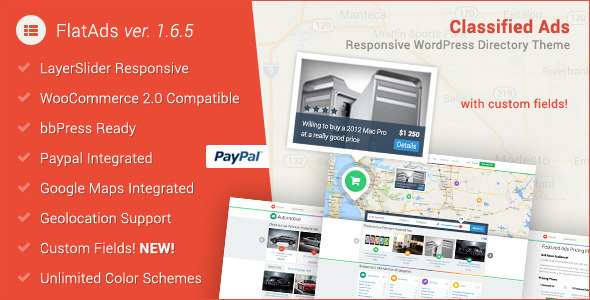 A powerful car dealer/automotive WordPress theme that will definitely help your site stand out from the crowd. A multi-purpose eCommerce theme you’ll likely fall in love with, Garbini was mainly developed for fashion and clothing stores. It has a plethora of customization possibilities, sorting options that enable customers to compare and classify products, as well as a modern and trendy design that will make an awesome first impression. The theme also includes the Visual Composer and Revolution Slider plugins for free, so it’s pretty much a bargain. 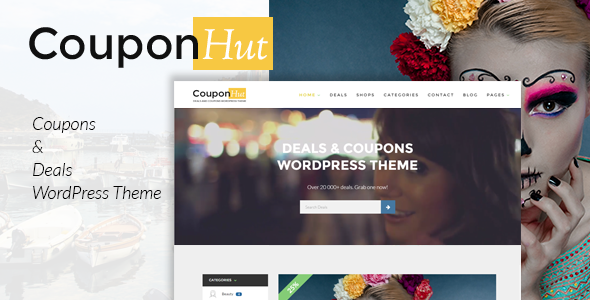 A theme meant for coupon and deals websites, CouponHut was created with great attention to detail and several customization options that will set you apart. It comes with an easy page builder, two types of deals (coupons and discounts), one click install, and a multitude of custom widgets. It also offers a rating system and a fantastic options panel, so both you and your users will enjoy a flawless browsing experience. Adforest is a powerful, professional, versatile, beautiful, elegant, and responsive classified Ad WordPress theme. You can tell from its design and features that this theme was built to meet the needs of any webmaster in search of a classified ad theme. Adforest has amazing and complex capabilities such as custom locations, bidding, user registration, radius search, multi-currency front-end, image reordering, messaging system, social logins, bad word filters, woo commerce, watermark for images, email templates, targeted ad slots, Google recaptcha, and mail chimp integrated. Try Adforest today and take your website to a whole new level! Why Choose One of the Best Classified WordPress Themes on Our List? WordPress themes come in many shape and colors, but the best ones stand out from the crowd due to their premium features and stunning design. When compiling our list of the best classified WordPress themes on the market, we focused on those build with the user in mind. Hence, they’re all extremely user-friendly and easy to install and customize, so you can build your advertising site without any hassle and focus on what’s really important: getting people to use it. Listing or classified websites are some of the most common web pages on the Internet. To make sure yours stands out from the crowd you need a memorable design that will make a great first impression. Throw in great functionality and visitors will keep coming back for more. As long as you choose of the best classified WordPress themes on our list, you’ll have both. Ready, set, advertise. As always, for more WordPress tips and tricks keep browsing our blog or subscribe to our website. I have a small arts and crafts store and I want to start selling online as well. Can you tell me what the best word press templates have to make a great eCommerce website? What should I be looking for? Thanks! If I offer my classified ads website for free for advertisers, can I still add an ads for monetizing purposes like google adsense? yes. Yes, you can still use AdSense ads even though you offer free classified ads on your website. I greatly appreciate for such useful and best collection of classified themes. Motor theme is one of the top leading theme. i did use another of the best classified theme the name is “Adforest”. they guys also did an awesome job. i personally refer that theme to include in your collection. again thank you for this blog.